Spring is an extremely exciting time for food and tradition. Miami's Chef Adrianne Calvo, who coined the catch-phrase "Maximum Flavor", is proving why this Easter, it's not about the bunny, it's about the Lamb in more than one way. 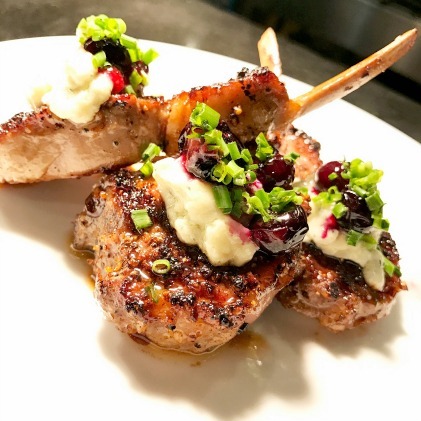 Calvo, who states every Thursday on her NBC Miami segment, Maximum Flavor Live, that she's "allergic to boring" shares this vibrant and delicious recipe for lamb chops. This Easter, forget roasting for hours. Instead opt for these bold flavors and whip out your grills. This recipe serves 2. Preheat the grill to high. Brush the grill with canola oil to prevent sticking. Combine Montreal steak seasoning and brown sugar in a small mixing bowl. On a clean work surface, lay out the lamb chops and season generously with mixture. Place on the grill and cook for 2-3 minutes on each side. Meanwhile, preheat an electric fryer to 375 degrees F. (or a small pot with canola oil to medium high heat) Flash fry the blueberries until the skin starts to break. Set aside. In a small pan, melt gorgonzola over medium heat. To serve, place lamb chops on the center of plate, spoon melted gorgonzola on each chop, add fried blueberries, and garnish with minced chives. I have never tried to use blueberries with a meat dish. I think it would be a new taste experience and do want to try this, especially with melted blue cheese.